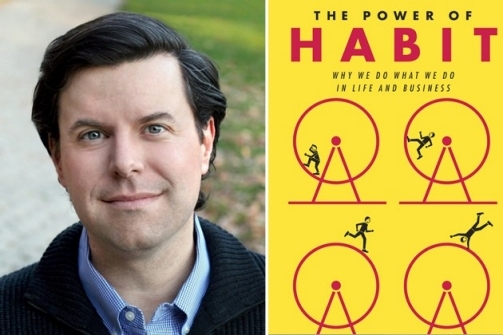 Here’s a potted summary of a fascinating, helpful book, Charles Duhigg’s The Power of Habit. “All our life is but a mass of habits—practical, emotional and intellectual—systematically organized for our weal or woe, and bearing us irresistibly toward our destiny.” William James. According to a study by Duke University—40% of the actions people perform each day weren’t decisions, but habits. Duhigg quotes an army major (who might have been a “methamphetamine entrepreneur” if he hadn’t entered the US Army, “one of the biggest habit-formation experiments in history”): “There’s nothing you can’t do if you get the habits right. A habit is a choice that we deliberately make at some point, and then stop thinking about, but continue doing, often every day. It is a formula our brain automatically follows. There is a three-step loop in our brain. First, a cue or trigger. Sadness or stress might make you want to eat chocolate. Or perhaps, you happen to see chocolate. Physical tiredness may be a trigger to exercise—or drink coffee or eat something sugary. Boredom can be a trigger to work on your Big Dream, or mindlessly surf the internet. Then is the routine—eat the chocolate. Surf the internet. Grumble at your family, or go for a run. And then the reward—endorphins from exercise, a serotonin boost from chocolate, adrenaline boost from exercise (or fighting). Over time this becomes automatic; without thinking, we reach for chocolate when sad (or pray); the internet when bored (or journalling). Nap when depressed (or run). A habit is born. Once we associate a cue with a reward, the brain creates a neurological craving for the reward (the chocolate high, let’s say) and creates a routine that satisfies that craving. Cravings drive habits. To overpower the habit, we must recognize which craving is driving the behaviour–for the sugar high, or the numbing or false excitement of the internet. We must be conscious. We might not remember the experiences that create our habits, but once they are lodged within our brains, they influence how we act, often without our realization.” However, just by looking at them become visible again. A habit : When I experience CUE, I will do ROUTINE, in order to get a REWARD. Cues, whether emotional or visual, can’t be changed, Duhigg says. When we are hungry, angry, lonely, sad, tired, stressed, overworked, bored, we will desire a reward. The only thing which can be changed is our response to the cue. HOW we get the reward. Identify the cue: What makes you make to indulge in your bad habit, whether it be chocolate, junk food, or surfing the internet? Is it boredom, low blood sugar, tiredness, stress, sadness or anger? What is the reward you are seeking? The burst of energy from the chocolate, the distraction and numbing of the internet, and Facebook? 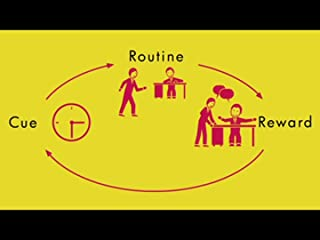 Substitute: You break the bad habit by substituting a different routine to get the rewards. Might popcorn work instead of chocolate? Would gardening, or a run, or 15 minute of blog reading work instead? Might a nap work instead of the cookie? Or journaling about the emotions that led to numbing behaviour? Or writing a fun blog? Or prayer as a relaxation activity? Duhigg: “Habits aren’t destiny. Habits can be ignored, changed, or replaced. Habits (good or bad) never really disappear. Once a habit is formed, the brain does it on auto-pilot. They’re encoded into the structures of our brain. The problem is that once you’ve formed a bad habit, it’s always lurking there, waiting for the right cues and rewards. This explains why it’s so hard to change our eating habits, or our sedentary habits or our addictions. Once we develop a routine of surfing the internet when bored, or snacking when sad, those patterns always remain inside our heads. By the same rule though, if we learn to create new neurological routines that overpower those behaviours—if we take control of the habit loop—we can force those bad habits into the background. And once someone creates a new pattern, studies have demonstrated, going for a jog or ignoring the chocolate becomes as automatic as any other habit. The process of change is accelerated when we form good habits to counteract the bad ones. The simplest way to begin making choices again is to have a plan. Planning your day in detail—what you will do, when you will exercise, what you will eat, makes sticking to a plan easier. To create a new habit, you need a trigger: When are you going to run? To do your yoga? To write? To pray? Without creating a specific time when you are going to do it, creating a good habit is but a nice intention. Good keystone habits start a chain reaction, a process of change that over time transforms everything. Keystone habits prove that success does not depend on getting every single thing right, but instead depends on identifying a few key priorities and fashioning them into powerful levers. The habits that matter most are the ones that, when they start to shift, dislodge and remake other patterns. When people start habitually exercising, even as infrequently as once a week, they start changing other unrelated patterns in their lives, often unknowingly. Typically, people who exercise start eating better and becoming more productive at work; they show more patience with colleagues and family. They use their credit cards less frequently and say they feel less stressed. Similarly, there is a correlation between eating dinner together and success at school and work. Making your bed every morning is correlated with better productivity, a greater sense of well-being, and stronger skills at sticking with a budget. Those initial shifts start chain reactions that help other good habits take hold. Australian researchers Oaten and Cheng put volunteers onto a two month programme that steadily increased their exercise –weight lifting and aerobics. The more time they spent at the gym, the less alcohol, caffeine and junk food they consumed. They spent more hours on homework and fewer watching TV. They were less depressed. In the next experiment, they asked people to budget, save, record expenses and deny themselves luxuries such as eating out and movies also drank on average two cups less of caffeine, less alcohol, less junk food, and were more productive at work and school. Participants in a program on creating study habits showed academic improvement, but also led to students smoking less, drinking less, watching less TV, exercising more and eating healthier. As people strengthened their willpower muscles in one part of their lives, the strength spilled over into what they ate or how hard they worked. Once willpower became stronger, it touched everything. When you learn to force yourself to go to the gym or start your homework, or eat a salad instead of a burger, you get better at regulating your impulses and distracting yourself from temptations, and focusing on a goal. Will power becomes a habit when you choose a behaviour ahead of time, and stick to it when you reach an inflection point at which sticking to it is hard. Willpower isn’t just a skill. It’s a muscle like the muscles in your arms and legs, and it gets tired as it works harder. So it’s important to do the really important things earlier in the day when your willpower is higher, to put first things first. Keystone habits are “small wins” that cause widespread shifts and changes. They help other habits flourish by creating new structures. Small wins have enormous power, a disproportionate influence. “Small wins are a steady application of a small advantage. Once a small win has been accomplished, forces are set in motion that favour another small win. Small wins fuel transformative changes by leveraging tiny advantages into patterns that convince people that bigger achievements are within reach.” In other ways, they create momentum, a virtuous circle. Hundreds of companies focus on understanding the neurology and psychology of habits. Most people don’t intend to eat fast food, for instance, but they are unconsciously influenced by cues, and seek rewards. Attacking the behaviours we think of as addictions by modifying the habits surrounding them is one of the most effective means of treatment. The Golden Rule of Habit change used by AA, use the same triggers or cues, gets the same rewards, but teaches new routines in response to the old triggers to provide a familiar relief. Alcoholics Anonymous also depends on faith. Admitting there is a higher power in one’s life, admitting one’s powerlessness. For habits to permanently change, people must believe that change is feasible. “You do need to believe that you can cope with the stress without alcohol.” A group teaches individuals how to believe. Everyone in Saddleback belongs to a small group which makes small group attendance and church attendance a habit. Faith becomes an aspect of their social experience and daily lives. Giving everyone new habits has become a focus of the church. Every Saddleback member is asked to sign a “maturity covenant card” promising to adhere to three habits necessary for spiritual growth. 1) daily quiet time for prayer 2) tithing 10% of their income 3) membership in a small group. They can be designed and changed—and that is the real power of habit. Anita, I loved this post. Loved it! Yes, I have been trying to break the negative habits of unconscious noshing at night, binging on sweets whether stressed or not, and putting things off until later (like picking up the house–I would love to have a cleaner, but my husband and I aren’t in that income bracket . . . so the house stays messy, my husband stays grumpy, and we replay that endless loop . . .). It took something serious to get me to finally acknowledge a serious health risk. I am the youngest of six siblings, and three of my older siblings now have adult onset diabetes. I know one of my grandparents died as a complication from adult onset diabetes. That was enough to give me a rude wake-up call. As a result, I’ve been doing yoga two to three times a week since last fall. Plus, in July, I started really watching my diet, limiting sugars and carbs, and increasing fruits and vegetables. My weight is ever-so-slowly coming off, but it IS coming off.